The Hindu epic Ramayana tells how the sons of the storm god were created. The goddess Diti wanted to have a child who would rival Indra, ruler of the gods, so she planned to remain pregnant for a whole century. When Indra learned of her intention, he upset her plan by hurling his thunderbolt at her pregnant belly. It shattered, but from the splintered fetus were formed the Maruts, deities of wind and storm. The term thunderbolt refers not only to dramatically, powerful energy, but also to the mysterious, heavy and dense irregular objects that were occasionally found on the ground. Even in olden times they were not regarded as ordinary stones, but rather objects from the heavens that could have possibly originated in the realm of the gods. Today, we know them as meteorites. Before metal was extracted by the use of intense heat, iron and other metals could occasionally be found in a usable form in conjunction with or embedded in, these thunderbolts. Anyone who possessed or knew where to find iron, nickel or even copper, was at a great advantage. They derived earthly power from the gift of the powers of heaven. The sacred Black Stone of the Ka'aba, the Islamic shrine at Mecca, Arabia, seems to be a meteorite. It is reddish black with red and yellow particles and is today in several pieces: three large parts and some smaller fragments joined together by a silver band. Its original diameter was about 30 cm. There is a second rock, built into the western corner, known as the Stone of Good Fortune. A sacred meteorite, the Willamette Meteorite, is a 15.5 ton, 10,000-year-old rock called Tomanowos (Sky-person) by the Clackamas (Grande Ronde) "Indians." They use it in religious ceremonies, but it is now confined indoors as the centerpiece of the New York Museum of Natural History's collection. In the 1800s, Admiral Peary, discoverer of the earth's North Pole, stole 3 important meteorites from the site known as Cape York. They included the Woman and the Dog meteorites, as well as the 34-ton Ahnighito (the Tent,) which were some of the very rare sources the Inuit could use for making durable tools. He sold them to a New York museum for as little as $40,000. Several similar thefts have occurred around the world. In Alberta (Canada,) the Tsu T'ina (aka Blackfoot) had their Manitou Stone known as the Iron Creek Meteorite stolen by Methodist minister, John McDougall, initiator of the Calgary Stampede. The sky gods of Greece and Rome, Zeus and Jupiter, were depicted hurling thunderbolts. This keraunos (thunderbolt) is virtually identical to the tantric thunderbolt, the vajra or dorje [or benzar] sceptre. Notice that in the small ceramic figure of Zeus, the keraunos in his raised right hand is closed. (It is a one-ponted vajra.) The earlier, Etruscan god, Tania, and the Gallic deity, Taranus, are similarly represented. On some coins from the Classical period, the 5- pronged bolt is depicted in the open or active position. Below, in a section from a marble frieze, we can see the open keraunos. Unfortunately, the lower half of the thunderbolt has lost some prongs. The Greeks referred to the supreme creative power controlled by Zeus in his capacity of demi-urge, as fire-ether. This is a metaphysical element that marries two of the usual 5 elements of the Classical world. It was as a thunderbolt that Zeus fatally embraced Semele, mother then, of Dionysos, god of ekstasis. Dionysos' attribute is the thrysos which somewhat resembles a one-ended dorje; it is a wand of willow wound in ivy crowned with a pinecone. Zeus used the bolt on Semele (aka Persephone) to take the baby from her and also to kill the healer, Asklepios, who presumed to restore the dead to life. 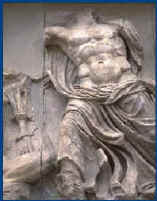 Jupiter, ruler of the gods of the Romans, was believed to wield the 3 thunderbolts of chance, destiny and providence. In English, the term used by the Roman poet, Virgil, for thunderbolt can be rendered as fire-spade. He describes this flaming dart or harpoon as having 12 points or tongues of flame: 3 of hail, 3 of wind, 3 of rain and 3 of fire. In The Aeneid, the Cyclops refashioned and polished these bolts of adding the 4 qualities of fear, riot, terror and rage. Thus having overthrown Ouranos’ rule the Titanes retrieved their brothers from Tartaros and gave the power to Kronos. But Kronos once again bound the Kyklopes and confined them in Tartaros. After ten years of fighting Ge prophesied a victory for Zeus if he were to secure the prisoners down in Tartaros as his allies. He thereupon slew their jail-keeper Kampe, and freed them from their bonds. In return the Kyklopes gave Zeus thunder, lightning, and a thunderbolt, as well as a helmet for Pluto and a trident for Poseidon. Armed with these the three gods overpowered the Titanes, confined them in Tartaros, and put the Hekatonkheires in charge of guarding them. ~ Apollodorus. The Library, 1.1-7. Any person struck by a thunderbolt is considered divine, as is the place on earth where the bolt lands. The word bolt refers to a heavy short arrow such as one shot from a cross-bow. It is two-headed symbolizing the bi-polar nature of divine energy: creative and destructive. When the bolt has cleft, split or otherwise destroyed something or some place, it is often described/depicted as a hammer or double-headed axe. In other words, sometimes the hammer is a form of the thunderbolt. The hammer is associated with transformation as with that of the smith, Hephaistos and the Norse god, Thor whose weapon is Mjolnir; the axe or mace with Parashu-Rama, the 6th avatar of Vishnu who learned weaponry from Shiva, and the double ax with the ancient Goddess of the Minoans. The Hindu god, Skanda, son of Shiva and god of war, and the Vedic gods Rudra, god of storms and Indra, king of the gods are also associated with these celestial weapons. Other smith-deities, gods with transformative powers, appear in the mythology of the Dogon of West Africa. The Yoruba know Shango [Xango] of the double-axe with 3 heads and 6 eyes. The Chinese smith, Tou shen also wields the ax. Weapons similar to the dorje include Thraetona's gurz, and in the Irish tradition, Cuchulainn's gai, Bulga, with which he slew Ferdia and the Fomors, a group of demons of darkness. Here is Jove's eagle clutching a 5-pronged bolt in its talons. item 3821. APULIA, VENUSIA, 268-217 BC. AE28 Quincunx, Sear 597. VF. The bird associated with Jove (aka Jupiter,) the Roman sky god, is responsible for thunder and lightning. The bird motif is common in a number of other cultures. For example, among the aboriginal peoples of the American Pacific northwest, lightning was explained as the flashing of its eyes. When a lightning strike left behind bark peeled off tree trunks, it was due to the slashing of the bird's claws. Umpundulo is the name of the thunderbird of southern Africa, to whom was also attributed the shredding of bark. It is the flash of the bird's gleaming feathers that produces the lightning, while thunder results from the flapping of its wings. Mediterranean civilizations understood there to be an ultimate reality which could be manifested by gods only. The thunderbolt and also similar weapons, such as the trident of Poseidon or Neptune, or the spear of Athena or Minerva, are the embodiment of that fundamental creative power. In iconography, such implements are known as the "attributes." The keraunos is also an emblem of sovereignty; the sceptre wielded as a reminder of the link and authority of what is referred to in Buddhism as the dharmakaya. It is a reminder, too, that ultimate reality can appear or intrude as suddenly and powerfully as a flash of lightening. So we see that in the Greek tradition, enlightenment is generally understood as coming from somewhere outside individual consciousness. In the red-on-black figure of Zeus which is an element in the decoration of a Greek calyx or wine bowl, the keraunos resembles a lotus flower. Min is the ancient pre-dynastic Egyptian god of energy as fertility and sexual potency. In depictions, he holds what appears to be a cable of two cords that he grasps at hip level in his right hand. It descends to the ground and then rises thus forming a U-bend since it is held up by the left hand. There, above the hand, it terminates in a double helix coil. This symbol is referred to as a thunderbolt. Indian mythology tells us that at the beginning of the cycle of the universes, there once was only one Being whose name is Prajapati. Not wanting to be alone, he produced the beings of the various realms including the gods, the demons and men. When the three groups of children were mature and it was time for them to assume their respective responsibilities, they went to their father for a final word of advice. First, it was the turn of the gods. Since Prajapati was a taciturn old man and very wise besides, he wanted to test them, so he took a deep breath and pronounced in a deep rumbling tone the single Sanskrit syllable: Da. He looked at the gods in a penetrating manner and asked, "Did you get that?" They looked at one another, at their feet and up into their eyebrows. "Yes, Sir," said the gods, "that must be short for damyata, or "control yourself." "
Then the human beings approached him for his advice and he said to them, "Da." "Did you understand that?" he asked. They looked at their fingernails and then they looked up at their father and replied, "Yes, Sir. You mean datta, "give charity"." Finally it was the turn of the demons. Again Prajapati rumbled, "Da" and then asked if they understood. The demons looked down at their feet and finally raised their eyes to their father's face. "Yes, Sir," said the demons. "It is short for "dayadhvam" and you mean "treat others as not different -- be kind, be merciful." "Yes," said Prajapati. "Please remember that. And also know that I am well pleased with all of you." Then they all bowed low before their father and went their separate ways. So when we hear the roll of the thunder booming "Da, Da, Da" we can think it is the voice of the Creator repeating his instructions to all the various kinds of beings. Or, we can consider the qualities of an excellent teacher who some consider to be the first Guru. His is an excellent teaching for it reaches each student according to his level of understanding, his karma, and his duty. At the beginning of time, when creation suffered drought, Indra defeated the serpent Vritra who had swallowed the waters of the world. He split the belly of the serpent with his thunderbolt, and by releasing the waters generated life. This killing of Vritra separated land from ocean, inducing the sun to rise. The vajra of this king of gods released the rain that induced fertility in the land. In Nepal, Indra Jatra is a festival devoted to Indra in his aspect as the rain god. This attribute or tool of the king of gods can likewise induce fertility of mind or what is commonly called "spirit," freeing the energy that is trapped or dormant in us, so that progress towards enlightenment is facilitated. Indra, also called Devendra, is usually depicted with four arms, riding a white elephant, a cord or noose in his left hand and his thunderbolt or vajra [Skt. benzar] in his right. He is said to ingest soma in vast quantities which causes his belly to swell. His noose is also viewed as a knot or a string -- a component of the net which is the matrix of the universe. String Theory, a scientific hypothesis that is a contender for the Theory of Everything. Indra's Net is said to have a brilliant jewel at each interstice [joining point] that reflects all the net [and jewels/diamonds] around it. It seems infinite in all directions, and is a symbol of consciousness or awareness. Also known as Sakka or Shakra, Indra is Devaraja or King of Gods and his epithet is Vajrapani, Bolt-bearer. Indra is the leader of the forces against the ashuras or titans. When the divine monkey-manchild saw the sun, he thought it was a ripe red fruit and made a grab for it. He also tried to attack Ayravata, Indra's mount. Lord Indra used his thunderbolt (vajrayudha) to stop him, but it hit the child's chin (hanu) causing him to hurtle to earth. That is how the Hindu deity received the name, Hanuman. During the war between the Devatas and Rakshasas, the latter tried to steal the divine weapons. The Gods (Devatas) were so astounded by this effrontery, that they did not know what to do and went to consult the Sage Dadhachi. This was a crucial matter, for the Universe was at stake. Dadhachi agreed to take custody of the weapons, keeping them by his side day and night and neglecting his own practices. The Rakshasas were just waiting for any opportunity to lay their evil hands on the weapons. Dadhachi waited as long as he could for the Devatas to return to pick up their things, and when they did not, he decided to get on with his life. Using his own divine powers, he put all the weapons into his lotah or pot and, mixing them well with the water there, drank it all down. Of course, now the Devatas returned and asked the rishi for their weapons. The Maha-rishi explained what he had done, pointing out that by now the weapons had all been assimilated into his own body as his very flesh and bones. While his poor wife, Swarcha watched from the safety of their home, Dadhachi the Rishi created a blazing fire through force of his own will, entered into it and reduced himself to a heap of cinders and gleaming segments of bone. Drawn by this act of devotion, Lord Brahma appeared and converted each of the faithful sage's bones into the various familiar attributes of the Devatas. The spine of Dadhachi became Indra's Vajrayudha which he used to vanquish the Ashuras and Rakshasas, and bring an end to the cosmic conflict. Legend says the compassionate Buddha had an existence as Shakra [Tib. Gya yin]. A catalogue of storm and fire deities. According to the account of Abdias of Babylon, there was a Persian sorceror called Arphaxat who was killed by a thunderbolt at the same time that Christian martyrs Simon and Jude died. April is the cruelest month ... mixing memory with desire. That is how The Wasteland, by TS Eliot (1922) opens. The publication of that poem marked a turning point in the aesthetic sensibilities of Western literature -- no longer is art merely what is inspiringly beautiful. Eliot forced us to acknowledge that all is not well with Western civilization. One of the sections entitled "The Fire Sermon" (the title refers to one of Buddha Shakyamuni's miraculous Turnings of the Wheel of dharma) ends with the poet's hearing in the rolling thunder, the Sanskrit words Dat-ta Dyadh-vam Dam-ya-ta (Give, Be compassionate, Control yourself ) followed by the hiss of Shantih shantih shantih. That is, "Peace, peace, peace." This remarkable poem was written at a time when Eliot was contemplating the teachings of Buddhism. William Golding in Pincher Martin, a tale about a slowly dying shipwrecked predator: "[Man is] ... a freak, an ejected foetus robbed of his natural development, thrown out in the world with a naked covering of parchment, with too little room for his teeth an a soft bulging skull like a bubble. But nature stirs a pudding there and sets a thunderstorm flickering inside the hardening globe ... ." Consciousness is the thunderstorm; the dorje symbolizes its fundamental nature. The one truth is pointed to by a hundred terms. This is the essential nature taught by a hundred signs. This is the wondrous practice guided by a hundred methods. This jewel of mind which dwells within. ~ Khacho Wangpo. The Rain of Wisdom: Vajra Songs of the Kagyu Lineage. Boulder /London: Shambhala, 1980. One reading of the tarot card that is the 4th in the series of 22 called the Major Arcana, The Emperor, finds that, "the bolt represents Zeus' dominion over the universe: the central orb is the earth, the upper point and the four surrounding tongues represents the four quarters of the heavens, and the lower point and its tongues represents the four rivers of the underworld. Four is . . . the number of cosmic order and completeness which is also reflected in this trump's Greek letter, delta, which is the numeral four. " Notice that the thunderbolt is depicted as having, at each end, four tongues around a central point. James M. Robinson, ed. The Nag Hammadi Library, revised edition. San Francisco: HarperCollins, 1990.